Here is a great opportunity for internships from the organization, Girls Who Code. Girls Who Code works to educate, inspire, and equip young women with the skills and resources to pursue academic and career opportunities in computing fields. Girls Who Code’s vision is to reach gender parity in computing fields. GWC believes this is paramount to ensure the economic prosperity of women, families, and communities across the globe, and to equip citizens with the 21st century tools for innovation and social change. GWC believes that more girls exposed to computer science at a young age will lead to more women working in the technology and engineering fields. Girls Who Code is aggressively recruiting 10th and 11th grade girls to apply to three of their summer immersion programs. In their summer programs, 10th and 11th grade girls will have an extraordinary opportunity to gain skills and be exposed to careers in computer science and technology. Girls will tour the halls of reputable tech firms such as Facebook, Google and Twitter, as well as learn how to create their own mobile apps, robots and more. There are only 60 spots available and applications are due online on Monday, April 15th. Applications can be found at www.girlswhocode.com/applynow . Eyewear Clothing, a Harlem, NY based clothing line, is seeking interns! From participating in fashion shows at colleges around New York state, to networking and marketing events, Eyewear Clothing has branded itself as a fun, vibrant young product. This is a great opportunity for those interested in design and marketing to gain exposure to the fashion realm! Public transportation travel and lunch expenses will be provided. To see some of Eyewear’s designs, visit eyewear-clothing.com. The Emma Bowen Foundation is actively seeking black male applicants for its paid internship work/study program with national media companies. Any minority student (African American, Hispanic, Asian or Native American) who is a rising high school senior, graduating high school senior or college freshman, has a cumulative grade point average of at least 3.0, is interested in pursuing a career in the media industry, and plans to attend a four-year accredited college or university is eligible to apply to the Emma L. Bowen Foundation work/study program. – Speak and write English fluently to be considered. Your grade transcript, at least two (2) educational references from teachers and/or advisors, and a 500-to-1,000-word essay must accompany the application form. 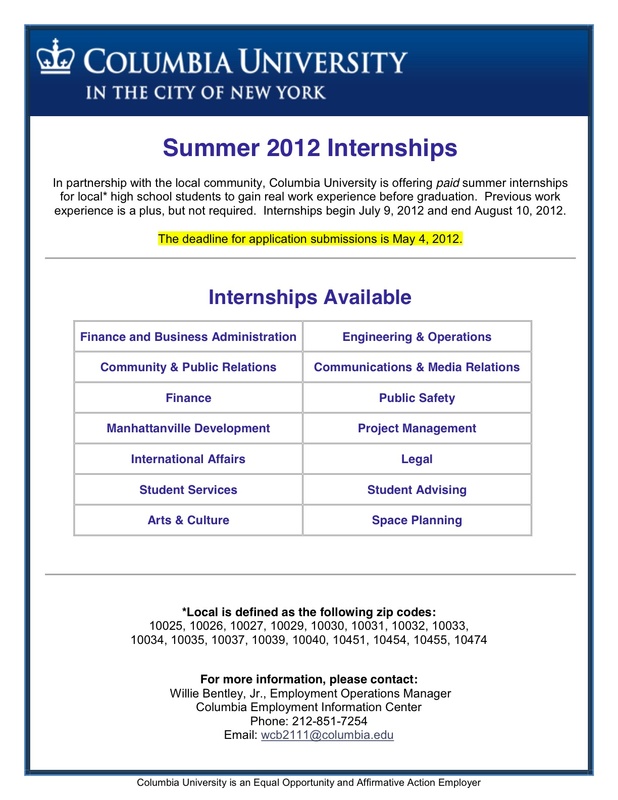 The illustrious Columbia University, is offering local* high school students PAID internships this summer. From finance and business administration to public safety, high school students are being awarded the opportunity to gain real work experience and exposure. If you know of any high school students that are looking to earn an income and begin, or even strengthen, their resume, contact Willie Bentley Jr. (contact information on the bottom of flyer). APPLICATIONS DUE MAY 4, 2012.